6. You know that even when your child tells you how much she hates you and threatens to move in with her birthparents, you still love her to bits. 7. You know that you couldn’t have produced a more perfect child if you tried. 8. You know that while love doesn’t conquer all, it sure makes things a lot easier. 9. You know that it’s ok that not everyone understands or agrees with your decision to adopt because it’s not their decision, it’s yours. 10. You know that while some people see “damaged goods” when they look at your child, all you see is their beauty and untapped potential. 11. You know that your child’s desire to know more about his birth family isn’t a rejection of you but rather stems from a need that every child has to know who he is and where he came from. 12. You know that when you adopt a child you not only become her parent, you also become her advocate. 13. You know that when people wonder whether it’s possible to love an adopted child as much as “your own,” you know that you couldn’t love your child any more than you do. 14. 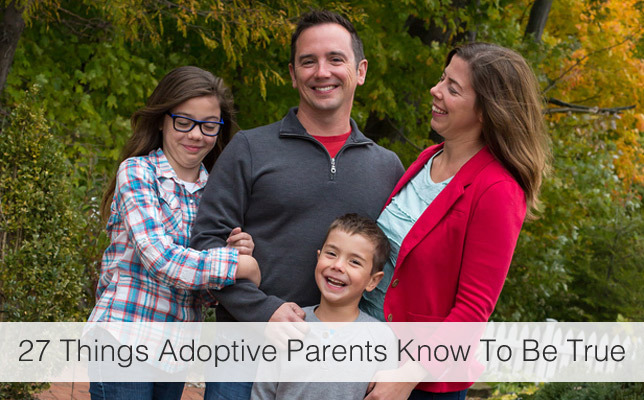 You know that even though adoption doesn’t cure infertility, it’s an amazing alternative. 15. You know that when it comes to parenthood, DNA is highly overrated. 16. You know that adoption is rooted in loss and that even the best parents can’t make that go away. 17. You know that your child’s birth family’s history and connections should be embraced not feared. 18. You know that while some people have been damaged and hurt by adoption, their story isn’t your story. 19. You know that as an adoptive parent, you will get asked questions that other parents never have to deal with such as “Where did he come from?” “Are they real siblings?” and “How much did she cost?” (And you know how to answer all of them expertly, without losing your temper). 20. You know that if you can get through adoption you can get through anything. 21. You know that even though you don’t notice that your child’s colour is different from yours, society does. 22. You know that anyone who says “why don’t you just adopt” has never tried to adopt. 23. You know that whenever you look back at your adoption journey, you can’t believe where you’ve landed. 24. You know that when people say your child is lucky you know you’re the lucky one. 25. You know that adoption is neither a better or worse way to grow a family, just a different one. 26. You know that adoption doesn’t end at placement. 27. You know that loving your child is so much easier than adopting her.